YOUR INTENSIVE CARE HOTLINE - THE 5 REASONS WHY YOU NEED TO BE DIFFICULT AND DEMANDING WHEN YOUR LOVED ONE IS CRITICALLY ILL IN INTENSIVE CARE! THE 5 REASONS WHY YOU NEED TO BE DIFFICULT AND DEMANDING WHEN YOUR LOVED ONE IS CRITICALLY ILL IN INTENSIVE CARE! and if you haven’t read, watched or listened to the update, you can check it out here. If you have found yourself in the situation that your loved one is critically ill in Intensive Care, you have probably found yourself in a difficult and challenging situation. You have probably also found that other people(the Intensive Care team) are driving the bus and you probably feel like you have no or little control, power and influence about the decisions that the Intensive Care team is making. Those decisions may or may not be in the best interest of your critically ill loved one. You probably feel very vulnerable and you may struggle, feel overwhelmed and you’re probably frustrated by the situation that you, your Family and your critically ill loved one are in. It’s not a very good position to be in and you should always contemplate what’s behind the Intensive Care team’s positioning. Even more important, you need to start being difficult and demanding whilst your loved one is critically ill in Intensive Care, because if you’re not, your critically ill loved one may actually not receive the best of treatment and care. It could even be worse and if your loved one is in a really difficult, life threatening situation or is a long-term Patient in Intensive Care, the Intensive Care team may position your loved one’s prognosis and diagnosis as a situation where they suggest to “withdraw treatment”, “withdraw life support” or they start talking about “futility of treatment”. If it has come to that point, it may already be too late and that’s why it’s so important that you and your family are difficult and demanding from the start, when your loved one is critically ill in Intensive Care. It sounds counterintuitive and it sounds like you need to go against the grain, when you’re difficult and demanding whilst your loved one is critically ill in Intensive Care. The reality is that if you’re not difficult and demanding you are like 99% of Families of critically ill Patients in Intensive Care who don’t position themselves correctly and those Families have no influence, no power and no control and those Families and their critically ill loved one are at the mercy of the Intensive Care team. Let’s look at those 5 reasons in detail. It’s a shame that almost 99% of the Families of critically ill Patients in Intensive Care put the doctors and the nurses in Intensive Care on a “pedestal” so to speak and they therefore think that the doctors and the nurses are “superior” to them. Those Families hand their power over on a platter and they’ll never be influential, have power and control over their critically ill loved one’s destiny. You need to stop doing that and you need to become difficult and demanding and you need to start asking the right questions now! You really need to understand how an Intensive Care unit operates on a psychological level, because if you’re not, the Intensive Care team might walk all over you, especially if a prolonged treatment of your critically ill loved one is on the horizon. The Intensive Care team may not have an interest in going through a lengthy, difficult and resource intensive treatment for your critically ill loved one and save their life. The Intensive Care team therefore may position your loved one’s prognosis and diagnosis in a very negative light and they may suggest to “stop or limit treatment”, because they don’t want to invest the time, the money and other resources into your critically ill loved one’s treatment. 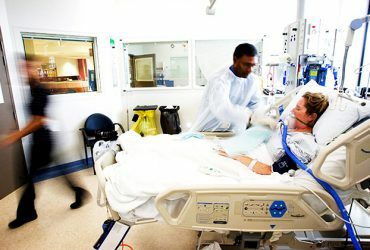 You need to know and understand the moving parts of an Intensive Care Unit in order to counteract the Intensive Care team’s positioning and you can do so by reading our blog, get access to your FREE “INSTANT IMPACT” Report at the end of this blog and you can do so by being difficult and demanding! Especially if your critically ill loved one is in a life threatening situation or in a situation where he or she is expected to be in Intensive Care for long periods of time, you and your Family need to be difficult and demanding! You want to know exactly what is going on and you only find out what is really going on, if you are asking the right questions and if you are difficult and demanding. Families of critically ill Patients in Intensive Care who aren’t difficult and demanding are always getting the short straw and if you’re not asking the right questions, your critically ill loved one may miss out on life saving treatment and life saving care. You can also get more information about what to do if your critically ill loved one is a long-term Patient in Intensive Care or is facing treatment limitations by clicking on this link below. The Intensive Care team is living and breathing Intensive Care every single day and they are like “Fish in water”. You and your Family on the other hand are like “Fish out of water” and most Families are completely out of their comfort zone. The Intensive Care team are most of the time in their comfort zone. They therefore often don’t even contemplate the questions you want to know, let alone take those questions seriously. They often also have the attitude of talking over you, rather than entering into a proper dialogue and discussion. Often, the Intensive Care team thinks they “know what’s best” and they therefore don’t really want to know your opinion. But that’s why it’s even more important that you’re difficult and demanding and that you’re asking the right questions! Again, as I mentioned earlier, if you’re not difficult and demanding, you’ll never have control, power and influence. If on the other hand you’ll get informed and learn what questions you need to ask, you become difficult and demanding and that’s when the power dynamics change and shift in your favour. Make sure you also check out our “your questions answered” where I answer your questions or send me an email to [email protected] with your questions!